The city of Rohini was as large as Cuttack (the capital of Utkala) and was situated on the banks of the Suvarnarekha river. Another river is known as Dolanga, whose water was just like Ganga, also passed through these lands. At a nearby sacred place known as Barajita, Rama Lakshmana and Sita had previously rested in Treta Yuga. The dense forests around Rohini were resplendent with several beautiful and attractive trees. Even the demigods were attracted to the beauty of this serene destination and frequently sported in these lands. At the center of Rohini stood the beautiful Palace of the royal kings of Mallabhum. The royal family used to reside here. Pious brahmanas who resided in the palace incessantly chanted the Vedic mantras. King Acyuta was exceedingly pious and was dedicated to the service of the brahmanas. However, only the ruins of this once glorious palatial mansion now remain in the town of Rohini. Gopijana Vallabha das, the author of Rasika Mangala, mentions how this land of Rohini, is actually not inferior to exalted dhams like Navadvipa, Ayodhya, Mathura, etc. Just like all the other places where Lord Krishna resides are as good as Vaikuntha, similarly, the places where His devotees reside are equally exalted. From his very childhood, Rasikananda was exceedingly devoted unto Lord Krishna. Whenever he would hear the names of Krishna, his voice would get choked with emotions and tears would glide down his eyes. During his grain ceremony, Rasika picked up Srimad Bhagavatam and grabbed the book to his heart. He took dust from anyone’s feet who uttered the names of Krishna. Rasika would protect sacred trees like Tulasi, asvattha, dhatri and would always bow down upon seeing the Vaishnavas.People would tell Acyuta that Rasika was not an ordinary child. Rasika found it difficult to remain calm and roamed about from village to village in search of his beloved Krishna. He would serve cows and feed them with his own hands. When Dayal dasi Thakurani, a renowned Vaishnavi, came to see Rasikananda, she saw the form of Gopala within him. She at once fainted. On being brought back to senses, she revealed how Rasika was not an ordinary child and how he would one day deliver the land of Utkala. Dayal dasi added that Rasika was a confidential devotee of Lord Krishna. Since his childhood, Rasika would chant a thousand names of Lord Krishna daily. He would refuse to have his food before he finished his chanting. Along with his friends, he would re-enact the pastimes of Krishna. He was very fond of hearing recitations of Srimad Bhagavatam. Rasika grew up to be an excellent student. He would instantly gain mastery over subjects that would take years for others to learn. He studied under the tutelage of great scholars of grammar like Vaidya Balabhadra Sena, Anukula Chakravarti, Kavi Chandra, and Yadunandana Chakravarti. None could match him in merit. He mastered the philosophies of Tarka, Sankhya, sankhyayana, Mimamsa and Patanjali. But above all, he enjoyed studying Srimad Bhagavatam the most. A devotee named Hari Dubey used to regularly discuss scriptures with Rasika, and together they spent a lot of time relishing the nectar of devotional pieces of literature. Balabhadra das, the zamindar of the nearby Hijli area, had a daughter named Iccha Devi who was a reservoir of unparalleled beauty and qualities. She was exceptionally sweet and her words very pleasing. When Balabhadra saw Rasika, he fainted observing the beauty and effulgence of the boy. He thought that the boy must be a great devotee of Narayana, for he exactly resembled the Lord’s appearance. Thereafter Balabhadra proposed that his daughter and Rasika should get married. He pleaded with Achyuta to accept his proposal. Iccha Devi, like Rasika, was a devotee of Lord Krishna and worshiped Him since her very childhood. She would make deities of Krishna out of mud and pray that she receives a husband like Him. Achyuta discussed Balabhadra’s proposal with his relatives who happily agreed. Balabhadra considered himself and his family very fortunate to be receiving a son-in-law as qualified and as handsome as Rasikananda. Balabhadra expressed to his relatives that Rasika resembled Lord Narayana in His appearance and his knowledge and learning were comparable to that of Brihaspati. Unfortunately, Balabhadra passed away before the two could get married. Balabhadra’s brother Sadashiva ensured that all necessary arrangements were taken care of. The date of marriage was soon fixed. The houses were decorated with paintings, gems , jewels, and all the necessary commodities were purchased. On the day of the marriage, Rasika was escorted to Hijli on a palanquin. Brahmanas, barbers, washermen, servants, accompanied the procession. Various gifts of food, clothes, and ornaments were carried upon horses. The sound of Mridangam and Kartalas surcharged the atmosphere with great bliss. People were amazed to behold Rasika’s beautiful form and they praised the good fortune of Iccha Devi. Rasika’s forehead was anointed with Kumkuma and sandalwood pulp. Flower garlands further enhanced his beautiful disposition. He adorned a crown embellished with precious jewels. His eyes were marked with Kajjala, his nose resembled a sesame flower, and his teeth were as beautiful as finely shaped pomegranate flowers. Betel leaves were used to further redden his beautiful lips. His body was decorated with precious jewels. He wore a yellow dhoti and wooden sandals. His brilliant effulgence, as if, blinded the three worlds. All the residents of Hijli came to witness this wonderful ceremony. The sacred chants of the brahmanas, coupled with the holy vibrations of sankirtana, resounded over the land and skies of Mallabhum. Soon Iccha Devi was brought to the dais. It is mentioned in Rasika Mangala how her beautiful face even put the moon to shame. Her lips were more beautiful than even the badhuli flowers. Gold ornaments and a golden silk dress further enhanced the beauty of her elegant body. Sadashiva, the brother of Balabhadra, offered the bride to Rasikananda. The couple resembled just like Lakshmi-Narayana. The ceremony took several days to complete and at the end of it, Sadashiva offered several valuable items as dowry. When Rasika returned to Rohini with Iccha Devi, Achyuta Deva became very pleased.He happily invited all of his friends and relatives, fed them sumptuously and offered gifts in charity. Rasikananda’s spiritual restlessness grew day by day. He spent most of his time discussing Srimad Bhagavatam along with other devotees. Sometimes he would run away to the forest and his relatives would bring him home. Understanding that Rasika desired to renounce his household life, Acyuta deva advised him to stay at home and assured him that he would provide him with everything he needed. Rasika expressed how he perceived wealth, family and prestige to be illusory. He explained how Krishna, Krishna’s name, His devotees and His pastimes are the only truth. He added how the worship of Krishna is the ultimate conclusion of the revealed scriptures. The town of Rohini was surrounded by dense jungles and was full of wild animals. Not very far away was a place known as Ghatshila, situated by the Suvarnarekha river. This is where the Pandavas had once rested in Dvapara Yuga. Rasika would often go to that place and meditate upon Krishna, the Lord of his life. On one such twilight night, while Rasika sat there contemplating upon the Lord, he received a vision of Lord Syamasundara, whose effulgence illuminated the entire forest. The Lord stood in front of Rasika, in His enchanting three-fold bending form, holding flute to His lips. His black curly hair was decorated with peacock feathers. He adorned yellow clothes and several precious jewels. Lord Krishna spoke to Rasika in a soothing voice and instructed him to seek the shelter of Syamananda, who was His dear devotee. He revealed that Syamananda was Rasika’s eternal spiritual master. By serving and assisting Syamananda, Rasika would attain the lotus feet of the Lord. Seeing Lord Krishna’s enchanting magnificent form which was more brilliant than millions of cupids and hearing Him speak, Rasika fainted in ecstasy. By the time he woke up, the Lord had disappeared. Rasika rolled upon the ground and tears of spiritual bliss glided down his cheeks. He stayed in the forest that night and continued to cry and search for his beloved Lord. Eventually, his relatives found him there and brought him home. As days passed, Rasika became more and more eager to meet Syamananda and began meditating upon him. To read more about the life and pastimes of Syamananda Pandita, one is requested to read one of our other articles entitled – ‘Sri Syamananda Pandita’s Bhajana Kutira & Samadhi, Kanupur (Near Balasore)’. Meanwhile, Syamananda Pandita was still residing in Vrindavana. It was then that Lord Krishna appeared before Syamananda and instructed him to go to Utkala and meet Rasikananda, His beloved devotee. The Lord instructed Syamananda to find Rasika, initiate him and then together deliver the land of Utkala. But Syamananda Pandita was very reluctant to leave the Vrajavasis and the land of Vrindavana. Hence, Sri Madana Gopala appeared before Jiva Goswami and repeated His instructions to send Syamananda back to Utkala. Thus it was receiving orders from the Lord, that Syamananda started for Orissa. Rasikananda spent his days happily at Ghatshila, meditating upon his Gurudeva. One day while Srimad Bhagavatam was being recited at the royal court, Syamananda Pandita arrived over there. His beautiful form, long arms, and smiling demeanor caught everyone’s attention. The King received him warmly and offered him a seat. Both Rasikananda and Syamananda, at once recognized each other, although they had never met previously. After the Bhagavatam recitation had concluded, Syamananda revealed to Rasikananda that he had come all the way from Vrindavana to meet him. He also added that Rasikananda was a confidential associate of the Supreme Lord. Syamananda stayed in Ghatshila for a few months. Rasika and Syamananda discussed on several topics relating to the science of devotion. Rasika surrendered himself unto the lotus feet of Syamananda. Hearing from Syamananda, Rasika became ecstatic with divine love. Soon Rasikananda and his wife Iccha Devi were initiated by Syamananda Pandita. Iccha Devi was given the name ‘Syamadasi’ and was ordered to personally serve food and water to the Vaishnavas. As days passed by, Rasikananda and his wife, Syamadasi, became more and more devotional. But seeing that Rasikananda was apathetic towards family life, his family members felt very sorry. After his father, Achyuta Mahasaya, had passed away, Rasika’s brothers began quarreling amongst themselves over the property. Rasika, however, was not involved in all these and spent his time serving the Vaishnavas and hearing Krishna Katha. He would personally wash the feet of Vaishnavas and then drink that water. He had no consideration for one’s caste or background. He and his wife used to honor the food remnants left behind by his guests. Seeing Rasika’s behavior, his brothers became enraged and thought that he would bring down the name of their family. But when his brothers began ridiculing the sadhus and Vaishnavas who visited Rasika, Rasika found it very difficult to tolerate. Rasika thought that it was of no use staying in the royal palace if he could not serve his guests there, without the fear of disturbance. Thus he decided to move out of the royal palace and live someplace else where he could execute his devotional services more peacefully. He consulted with his wife Syamadasi, who at once agreed to accompany him wherever he would take her. The couple selected a quiet place, on the bank of the Suvarnarekha river, as their new residence. The place was surrounded by mango and jackfruit trees and was exceedingly serene. 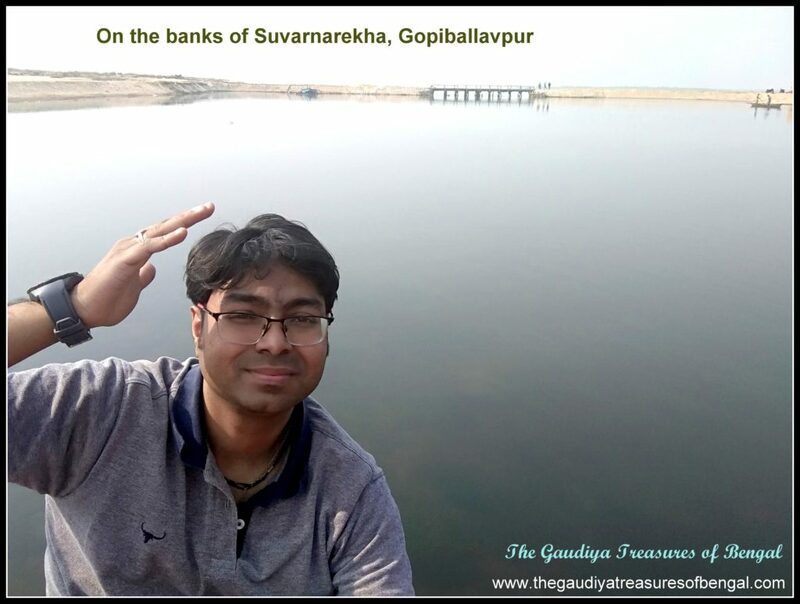 The water of Suvarnarekha was as pure as that of Yamuna. This place was not well known and was kind of concealed before the couple had arrived. However, its beauty attracted even demigods. Even in the rainy season, no mud accumulated here. Rasika’s elder brother Kasinatha, was the ruler of these lands and this land hence came to be subsequently known as Kasipura. The only belongings that Rasika and his wife possessed at that time were the clothes they were wearing. They also brought with them the family deity that was previously worshipped by Rasika’s forefathers. This deity had been previously lost in a war by Rasika’s forefathers to the kings of Mayurbhanj several years ago. After leaving the palace, Rasika went to Mayurbhanj and brought this deity back with him. In the course of time, Rasika built a beautiful house, here at Kasipura, and he became very famous. However, the financial condition of his brothers gradually dwindled. Rasika now began serving sadhus and Vaishnavas at his new residence and he suffered from no shortage of wealth. He also gifted his guests with many clothes and ornaments. When Syamananda Pandita visited Rasika in his new home, he was delighted. When Rasikananda informed Syamananda Pandita about his family deity, Syamananda named the deity as Gopi-vallava Raya and he named the place after the deity, as Gopiballavpur. He made Rasika’s wife Syamadasi the chief priest of the temple. Syamananda added that Gopiballavpur shall soon become as famous as Vrindavana. Hare Krishna and His devotees would be served very nicely. From then on, Kasipura became renowned as Gopiballavpur and Rasikananda established his preaching headquarters at this place. As days passed, Gopiballavpur became just like a second Vrindavana. Little children enacted beautiful pastimes of Lord Krishna and the residents remained absorbed in singing His glories. In the course of time, Rasikananda wished to perform the marriage of his beloved Gopi-Vallabha Raya.He hired artists and engaged them in carving a beautiful deity of Sri Radhika. All the necessary articles and paraphernalia for the marriage were procured. Rasika announced a great festival and invited several sadhus and Vaishnavas to the marriage ceremony. The festivities continued for three days in which all the invited guests completely forgot themselves and became oblivious of this material world. All of them floated in waves of spiritual bliss. This great festival was held at the house of a devotee named Rasamaya, who lived in Dharanda. At the end of the festivities, the deities were brought back to Gopiballavpur. When Rasikananda saw Radharani standing beside Gopi Vallava jiu, he became intoxicated with mellows of divine love. Incessant tears of ecstatic love glided down his eyes. While touring Jagannatha Puri, Rasikananda was instructed by Lord Jagannatha to carve a beautiful deity of Lord Govinda and worship Him. By the will of Providence, Rasikananda then met with two skilled craftsmen by the name Raghunatha and Ananda Kaurila. He took these two men along with him to Thuriya, where he met with Syamananda Prabhu. On being introduced, Syamananda initiated these two men. Syamananda instructed Rasikananda to carve the deity of Govinda deva as per Lord Jagannatha’s wishes. Three deities were subsequently carved by Raghunatha and Ananda. First, two of them were installed at Thuriya and Shyamsundarpur. The deity that was installed at Thuriya was named as Sri Vrindavana-Chandra. The third deity that was carved, was installed at Gopiballavpur and was named as Govinda Raya.The enchanting deity of Sri Govinda deva is still worshipped at Gopiballavpur with all due reverence. Syamananda Pandita instructed Rasikananda to preach far and wide. He instructed Rasika to induce everyone to chant the Hare Krishna maha-mantra (Hare Krishna Hare Krishna Krishna Krishna Hare Hare, Hare Rama Hare Rama Rama Rama Hare Hare) irrespective of one’s caste, creed or religion. By the mercy of his Gurudeva, Rasika preached widely and his disciples were countless. He was a great preacher and a stalwart scholar. No one could dare refute his words. In one such pastime, Rasika challenged the two sinful brothers, Bhima and Srikara, to summon all of their scholars in a debate. These two fallen souls were the rulers of Dharanda (a place not very far from Gopiballavpur) and there was no crime that they did not commit. Rasika announced that he was ready to debate on Vedas, Smriti, Sruti, Gita, Bhagavatam, the teachings of Vyasa, Sukadeva, Narada, Janaka, and others, in order to establish the supremacy of Vaishnavism. Accordingly, several expert scholars from various kingdoms arrived. In the fierce debate that ensued, all of these scholars accepted defeat and surrendered unto Rasikananda. Thereafter Bhima and Srikara became Rasika’s followers and submitted unto him. In due course of time, the entire town of Dharanda accepted Gaudiya Vaishnavism as their way of life. Let us recite another of Rasikananda’s innumerable exalted pastimes before we move onto the next section. When Rasikananda came to know that heretics were oppressing people in Vanapura and several parts of Orissa, terrifying them (Kings, landlords and general people) and forcing them for religious conversions, he decided to act. Begging permission from Syamananda Pandita, Rasika set out for Vanapura to meet Ahmed Beg Subadara, their leader. When the Subadara learned that Rasikananda was preaching so widely and had so many followers, he became incensed and decided to meet him. Rasika’s companions begged him to return and not go anywhere near the sinful Subadara, who was renowned for his killings and ferocity. But Rasika did not pay heed to these warnings and proceeded to meet him. Just at that time a wild elephant entered the village and began causing destruction. He trampled several houses, people, cattle, uprooted large trees, etc. The cruel Subadara then understood that the elephant had gone wild and has killed so many people. He challenged Rasikananda to tame the elephant by giving him Krishna Prema. He also added that he would accept Rasika as a messenger of God if the elephant could be tamed by him. When the elephant approached Rasika, he checked his speed seeing Rasika’s beautiful form. Rasika then spoke in a soothing voice and instructed the elephant to worship Krishna and serve the devotees. He cited different scriptures and conveyed that it is the conclusion of all of them, to worship Lord Krishna, who is the mother, father and the life of all living beings. He cited the reference of Airavata, Indra’s elephant, whose pride was previously crushed by Lord Krishna. He also cited the reference of Gajendra, the king of elephants, whom Krishna had saved during his fight with the crocodile. Rasika requested the elephant to give up his puffed up nature and worship Krishna, the supreme personality of Godhead. There was a visible change in the elephant. He was only able to meet Rasikananda owing to his pious Karmic past. He fell down at the lotus feet of Rasikananda and washed them with his hot tears. He repeatedly paid obeisances unto Rasika and did not want to leave him. Rasika initiated the elephant and named him Gopala das. Finally, the elephant slowly left that place and moved back into the forest. Witnessing this pastime all present were struck with wonder. Ahmed Beg Subadara came and fell down at Rasika’s lotus feet. He apologized for not having recognized Rasika’s exalted position. He repeatedly begged for forgiveness. Rasika forgave the Subadara and preached him regarding the glories of Lord Krishna. The Subadara left his cruel ways and became a devotee of the Supreme Lord. Before Sri Syamananda Pandita passed away, he entrusted Rasikananda Prabhu to take care of the entire Syamananda sampradaya (devotees in the line of Syamananda Pandita). Following Syamananda’s orders, Rasikananda initiated innumerable people all over Utkala and he greatly expanded the movement. Every year, Rasikananda Prabhu organized a grand Rasa Yatra festival at Gopiballavpur. The dense forests and the Suvarnarekha river added to the enchanting beauty of this festival. Suvarnarekha was used to transport various goods through the waterways and played a critical role in making the festival a success. However, when Rasika observed Suvarnarekha’s water shrinking from its bank, he felt greatly distressed. He ordered Suvarnarekha to bring her waters nearer to the bank as it was causing a lot of hardship for the devotees. That night a great flood brought Suvarnarekha’s waters closer to the bank. This pastime left everyone awestruck and also showed how no one could disobey Rasika’s orders. One of these Rasa Yatra festivals was attended by thousands of Gaudiya Vaishnavas from all over India. It is said to have been the largest congregation of the Gaudiya Vaishnavas to have taken place, after the festival of Kheturi. It was attended by Syamananda Pandita, sons and grandsons of both Nityananda and Advaita Prabhu, disciples and grand disciples of the twelve Gopalas, sixty-four mahantas, Ramadasa Thakura, etc. The Caranamrita (holy water collected after washing their feet) of all these thousands of great devotees are still carefully preserved in this temple since the last five hundred years. You can request the temple priest, here at Gopiballavpur, to give you a drop of this great mercy. Rasikananda disappeared from this world in the month of Phalguna (March-April), the day after Shiva Chaturdashi, by entering and merging into the deity of Gopala at Remuna (Khiracora Gopinatha temple). His disciples have created a samadhi tomb for Rasikananda Prabhu at the Remuna temple which continues to attract pilgrims till this day. Sri Rasikananda Prabhu had three sons: Radhananda, Krishna-gati and Radha Krishna das who took over the reins of the movement after Sri Rasikananda disappeared from this world. This family has produced great scholars and preachers whose influence has been felt throughout the Gaudiya Vaishnava society. 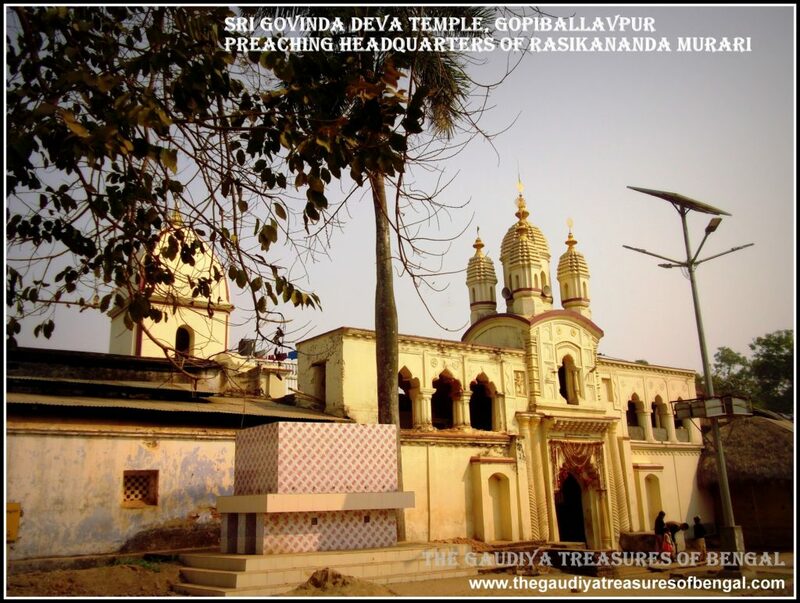 The present servants of Sri Govinda deva temple at Gopiballavpur are also the descendants of Sri Rasikananda Murari. 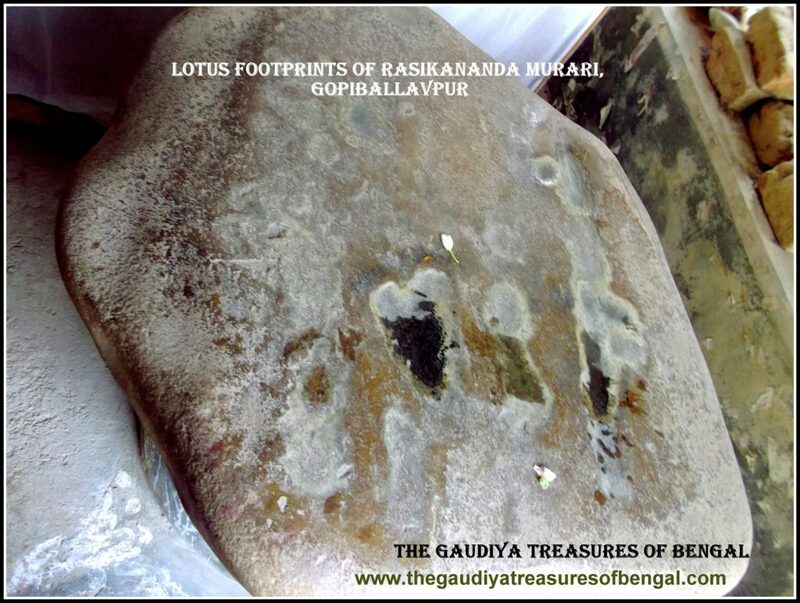 The lotus footprints of Sri Rasikananda prabhu, which are engraved upon a stone. A great Rasa yatra festival took place here at Gopiballavpur which was attended by thousands of Gaudiya Vaishnavas from all over India. This is said to be the largest Gaudiya Vaishnava congregation to have taken place ,after the festival of Kheturi. The Caranamrita (holy water collected after washing their feet) of all these thousands of great devotees are still carefully preserved in this temple since the last five hundred years. You can request the temple priest to give you a drop of this great mercy. Please do not forget to take darsana and bathe in the holy Suvarnarekha river. Her water is as pure as that of Yamuna. 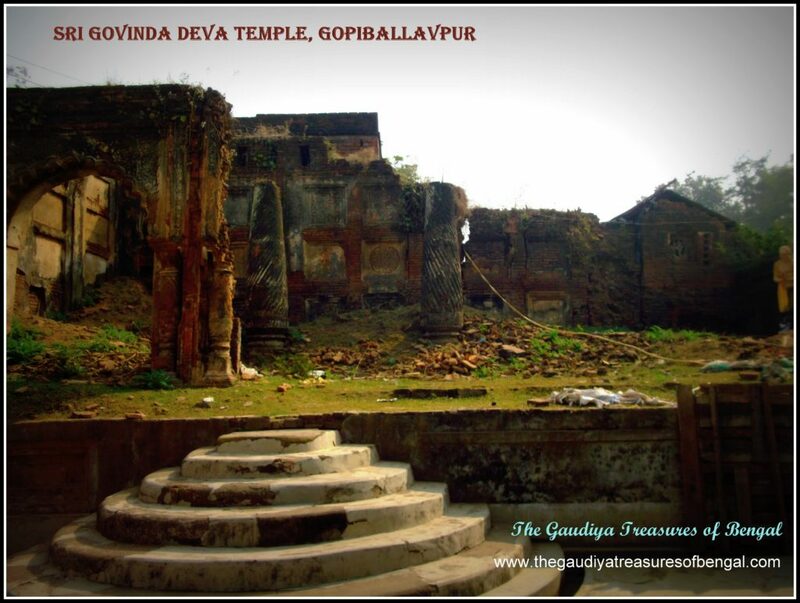 Gopiballavpur, standing on the banks of Suvarnarekha, is also known as Gupta Vrindavana. Not far from Gopiballavpur, amidst the dense forests, lies the ashram of Valmiki muni. It is said that mother sita had resided at this place along with Lav and Kush, after she was banished from Ayodhya. 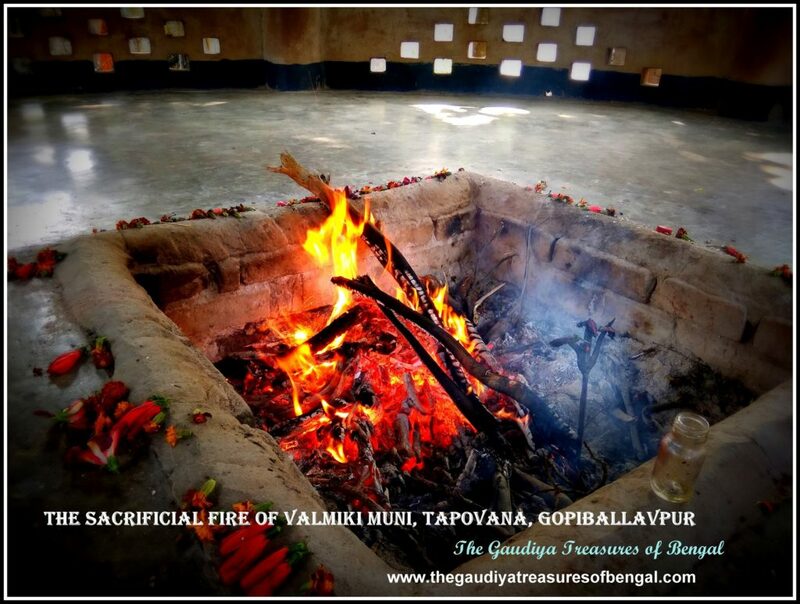 Here the sacrificial fire of Valmiki muni has been burning since the Treta Yuga. The place is now a renowned tourist destination and is popularly known as ‘Tapavana’. We worship the lotus feet of our spiritual master ,whose causeless mercy has empowered us ineligible fools ,to gain entrance and take up service in this exalted abode of Gopiballavpur. 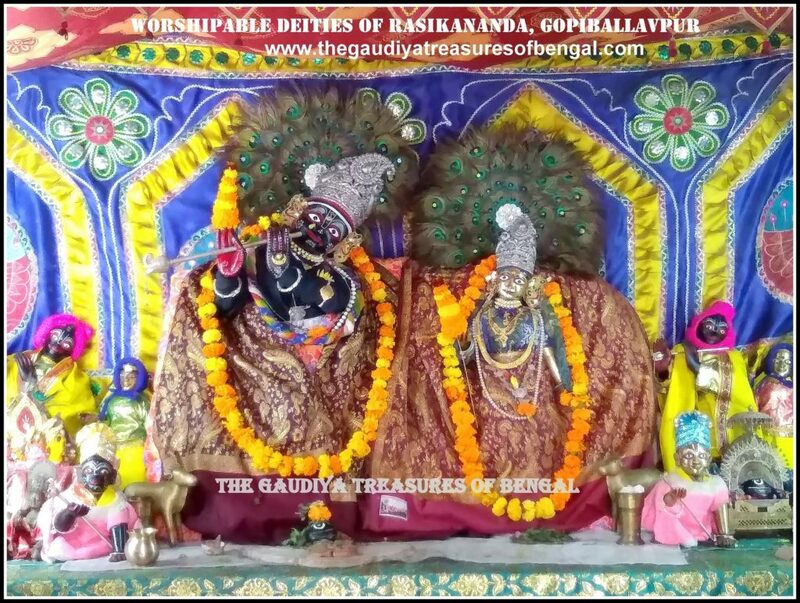 We seek shelter of this holy land, and pray that its glories remain forever imprinted in our heart.‘The Gaudiya Treasures of Bengal’ offers millions of obeisances and humbly prays to Sri Rasikananda that we advance in our Krishna consciousness, develop attachment unto the lotus feet of Lord Gauranga and are able to serve Sri Guru & Vaishnavas, by our honest and sincere efforts. We seek his blessings and compassion , in successfully rendering this humble service of reciting the pastimes and revealing the pastime places of the Supreme Lord and His beloved associates.We shall consider ourselves greatly fortunate and our existence meaningful if Lord Gaurahari and our dear spiritual master are kindly pleased with our endeavours. One can choose to stay at the Government resorts of Jhargram (Jhargram Rajbari tourist complex) ,situated in the West Medinipur district of Bengal. Jhargram is well connected to Kolkata via roads and railways.Gopiballavpur is hardly an hour’s drive from Jhargram.The Sripat of Rasikananda at Gopiballavpur is renowned as Radha Govinda Temple and is situated not very far from the Gopiballavpur Police station. Accommodation – One can choose to stay at ‘Jhargram Rajbari tourist complex’, which is managed and run by the local government.Gopiballavpur is hardly an hour’s drive from Jhargram.